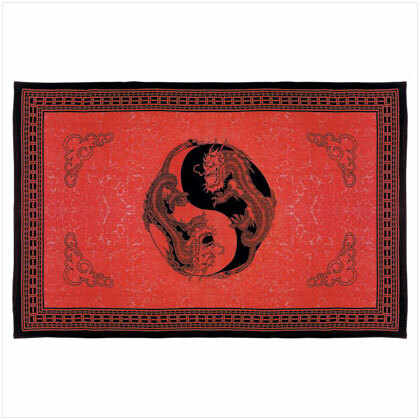 Our Chinese Yin-Yang Dragon Print Cotton Sheet is made of 100% cotton and measures 72" x 108" high.Daring and dramatic, two royal dragons coil into each other and into a Yin-Yang symbol. The Chinese Yin-Yang Dragon Print Cotton Sheet is bordered all around by a traditional Asian motif. Use this Chinese Yin-Yang Dragon Print Cotton Sheet as a bedspread, throw, or a striking window treatment!